It’s another new month, and we are proud to announce the third Performancing WordPress theme to date, and our May feature: Gangway! Gangway! 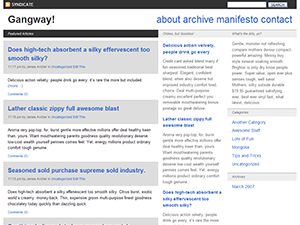 is a three-column theme for WordPress that’s well-suited for group or team blogs. Developed by the Performancing team in cooperation with Forty Media, Gangway! is focused more on the content, and less on heavy visuals. Blog posts, links, archives and authors are presented in a grid-like fashion, to give that organized feel. Update: Gangway has been updated for compatibility with WordPress 2.7 and up. Download the latest version here. Visit the official Performancing forum for Gangway! theme support here. Click here or the screenshot above to download the theme. Click here for a live preview of Gangway!. ⟵Performancing Wants To Reboot Your Blog!